This is the origins story of the My Concrete app when it was first launched to market. For the latest results on this work, please see the updated case study here. New mobile technology is set to answer the burning question of construction site managers around New Zealand and is the first of its kind to launch here. The ‘My Concrete’ app shows customers exactly where their concrete delivery is. It’s been developed by Sandfield with Allied Concrete to provide full visibility of concrete orders in construction projects. It includes real-time mapping and arrival estimates of individual concrete orders, with details of truck size, load size and schedule details. The app also integrates weather mapping and live traffic feeds, which are critical in predicting the likelihood of thermal and plastic cracking when pouring concrete. Allied Concrete and its associated concrete layers provide professional concrete solutions and services, with 50 plants and several mobile plants nationwide. They poured one million cubic metres of concrete in the past year - an average of one Olympic swimming pool per day. Demand is increasing with a number of important construction and roading projects underway throughout the country. "We’re currently averaging a thousand truckloads of concrete pours per day - which is about 40 truckloads every hour"“The Allied Concrete call centre is flooded with enquiries daily from 2am, construction projects often need concrete deliveries confirmed to start their working day. We’re currently averaging a thousand truckloads of concrete pours per day - which is about 40 truckloads every hour. We wanted a technology solution that would automate this volume effectively,” says Dave Barker, National Sales and Marketing Manager for Allied Concrete. “‘Once concrete is set, it’s set. A continuous pour is crucial to a successful job - the app enables that steady pace and continuity. Our new app lets users securely share job information with other app users to keep our customers who are contractors, pump operators and others informed on concrete progress, to be able to manage the concrete and their time more effectively,” said Mr Barker. 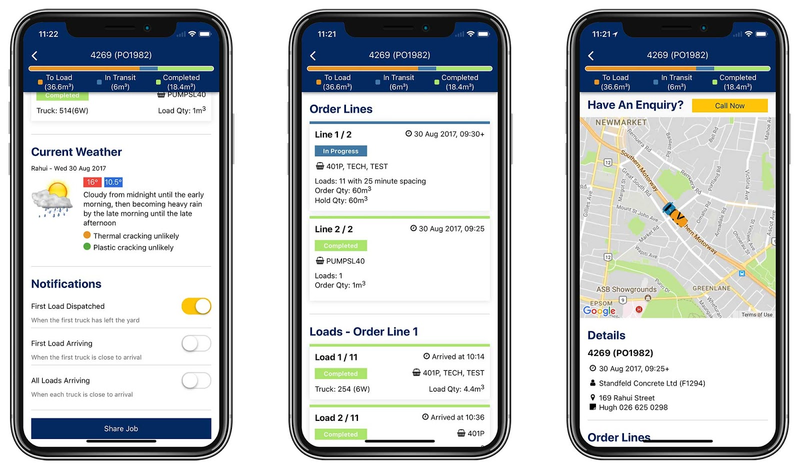 The Allied Concrete mobile app was developed by Sandfield, a custom software company that’s been developing innovative supply chain systems for nearly 30 years for the likes of Mainfreight, Green Acres and Qube Holdings. “The design of the ‘My Concrete’ app simply centred around what people wanted. We went on site and talked with everyone involved in the concrete order journey - from the Allied Concrete call centre staff, to delivery truck drivers, to the construction workers and project managers,” says Jonathan Clarke, Solution Manager at Sandfield. The solution developers integrated four data sources into a streamlined user-friendly interface for the mobile app. The app was able to leverage Allied Concrete’s existing IT investment to give their customers more visibility from the operational perspective of its trucks and planning systems. The Sandfield team also integrated WxAdvisory weather and time factors that influence how concrete sets. "‘My Concrete’ gives customers full visibility, enabling them to have a clear flow of communication"“Around any supply chain there are different parties all trying to pull off the end goal. ‘My Concrete’ is a tool that streamlines all of the important data and factors involved in pouring concrete to enable these stakeholders to work more effectively together and achieve that end goal much more easily,” adds Clarke. “‘My Concrete’ gives customers full visibility, enabling them to have a clear flow of communication. This means they can better organise their site and ultimately work more efficiently. We want to make the hard easy during these especially busy times.The app also has a review capability to ensure we’re getting continuous feedback from customers on product and service, to ensure things keep getting easier,” said Dave Barker. The next staged release of ‘My Concrete’ will see Allied Concrete and Sandfield developing the ability to customise scheduled jobs, adjust job spacing, provide site access details and enable customers to easily order concrete on the spot during busy projects. More than 12 thousand push notifications have been sent in the month of the app going live.